For SAMS Odisha +3 (Degree) 4th phase admission 2018 a notice released at samsodisha.gov.in against vacant the seats in +3 Degree Colleges in Odisha. The Odisha +3 Degree 4th phase process 2018 for +3 Degree Private and Government Colleges in Odisha will starts from 25th August 2018 through offline mode. In the Odisha +3 Degree 4thphase process 2018, the seats lying vacant in +3 Degree/ Autonomous Colleges for the 1st-year class shall be filled up through offline mode at the college level. And candidates who want to take admission +3 Degree colleges in Odisha they can apply offline from 25th August 2018 to 28 August 2018. The candidates can apply only offline mode at the college level and selection will be made at the college level. The merit list of +3 Degree 4th phase admission will be out on 29 August 20185 at college notice Board and selected candidates can take admission into selected +3 degree colleges by 30th August 2018. For eligibility for applying for Odisha +3 Degree 4thphase 2018, please go through official notice which has been given a link below. 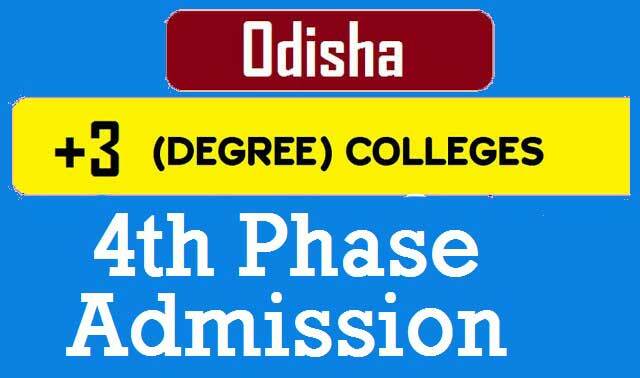 In this way, the candidates can apply for +3 Degree colleges in Odisha in the 4th phase admission process. If you like this post very much please share this post to your friends and relatives and also you can join with us in social media.